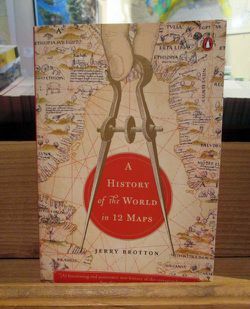 Historian Jerry Brotton tells the story of twelve influential maps of the world starting in Roman Egypt and ending in Silicon Valley. From clay tablets to GPS, how maps are made and what they show (or don't show) can reveal a lot about the people who use them and how they perceive the world. Each chapter tells the story of the mapmakers and historical context behind a particular map, and the maps themselves appear in color plate illustrations.